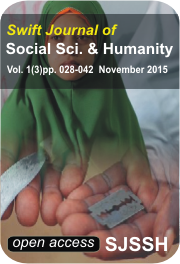 A comprehensive study was undertaken to investigate, explore, and analyse the existence of Female Genital Mutilation/Cutting (FGM/C) in Iran. The time span of this study began in 2005 and ended in 2014. The aim of this study was to provide in-depth data on FGM in Iran and, at the same time, provide the building blocks for a comprehensive program to combat FGM in Iran and bring this issue onto the world�s agenda. The methodological approach adopted by this study was primarily participatory due to the sensitivity of the subject matter. Most parts of this research were completed by the end of 2014 and much has been achieved over a decade of studying the subject of FGM in Iran. The study included travelling thousands of kilometers and interviewing over 3,000 women and 1000 men from various areas and social classes, including key role players, community leaders, clerics and religious leaders in order to compile comprehensive data about the practice of FGM in Iran. The findings demonstrate that FGM in some locations is widespread among women and girls (around 60% in some villages of Qeshm Island in Southern province of Hurmozgan, especially in the villages of the four provinces in the northwest, west and south of Iran). FGM was not,however practiced in the northern parts of West Azerbaijan, where people are Turkish Azri and Kurmanji Kurdish speakers, nor in the Southern parts of Kermanshah and Northern parts of Hormozgan. This research study along with ashort documentary film has gained global recognition and was launched by the Guardian and BBC on June 4th, 2015 through their websites. Shortly thereafter it was discussed at a United Nationsmeeting of the Human Rights Council in Geneva,on June 19th 2015 at a session on eliminating FGM/C.Reuters also published the analysis of the research and considered it one of the rare contributions in the history of Iran. Kameel Ahmady, Prevalence of Female Genital Mutilation/Cutting in Iran. Swift Journal of Social Science and Humanity 1(3), pp. 028-042.